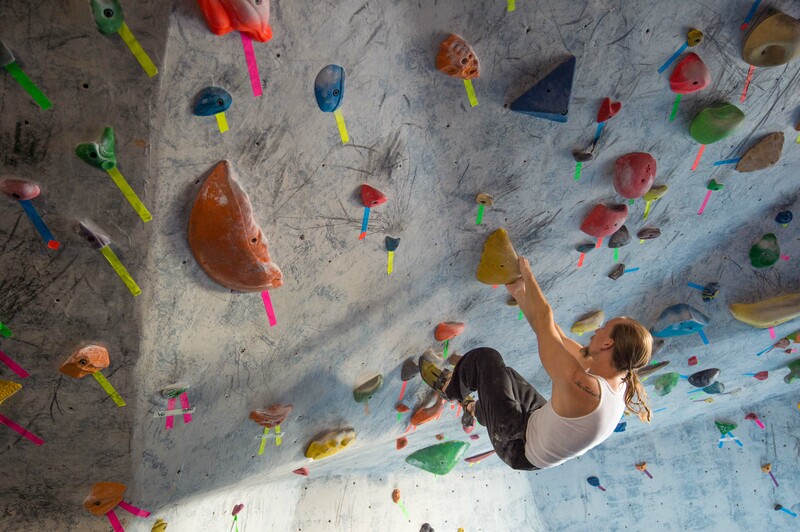 Jay Calleton shows some moves at Arcadia Rock Climbing’s walls. They’re located at 305 N. Santa Anita Avenue. Here’s the skinny and then some on the new Gold Line Extension, btw. Well behaved traffic on the 134 during the afternoon rush hour on Wednesday. 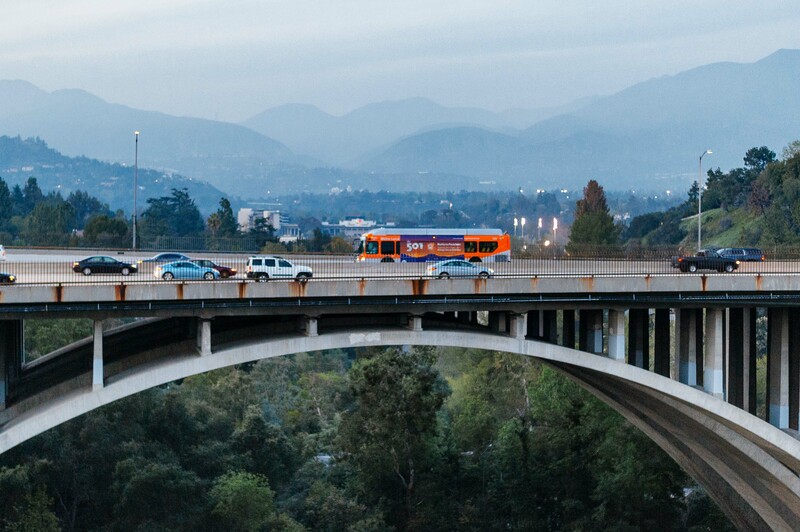 Meghan McCarthy interviews a colleague who lives in North Hollywood and works at KPCC’s headquarters in Pasadena, which is a short stroll from the Gold Line’s Memorial Park. The verdict: the colleague says that she’s never gotten to work faster, citing a 41-minute ride time when leaving NoHo at 8 a.m. on Thursday. Other 501 riders — how’s it going so far? I went out at sunset on Wednesday to take some pics of the new express bus from the Colorado Avenue bridge in Pasadena and traffic was moving fine in both directions on the 134 the entire time I was there between 5:30 and 6:10 p.m. My experience is this part of the 134 is generally moving — it’s the 210 east of there where, to put it politely, things degrade. Will this rail extension immediately drastically change transportation here? It will not. It may not even make a visible dent in the nightmarish traffic on the 210. But a commuter who lives in Duarte and works in Highland Park will now have an option besides driving. And when that option extends to the commuter who lives in Upland and farther east, we’ll be getting somewhere. The environmental studies for the Azusa-to-Montclair phase of the project have been completed and design and engineering work is underway. But the most important piece of the puzzle — the more than $1 billion in funding needed for such an extension — still must be secured. Stay tuned, people. For columnist Joe Mathews, the new Gold Line and Expo Line extensions are personal. He lives five blocks from the Gold Line and works in Downtown Santa Monica, meaning he’s currently spending four hours a day in his car. He is looking forward to the future Gold Line-Expo Line commute that will still take time (about three hours) but will be more predictable and allow him to get some work done. Of course, none of this is guaranteed. Metro needs to make sure the trains are safe, reliable—and, most of all, fun. The new Gold Line cars looked great in a recent preview, with big windows and comfortable seating. And on the Expo Line, those trains better have strong Wi-Fi and maybe tables for us working commuters. I’m most excited about the surprises that these new rail lines—and other lines under construction—will bring us in the future. What new communities, new downtowns (the city of Duarte sure needs one), new businesses, and new friendships might emerge of which we can’t conceive? What new ideas might come from, say, a doctor riding to her job at the City of Hope meeting a Caltech computer scientist on a Gold Line train? FYI: Wifi is supposed to come to all underground stations and tunnels for Metro — I haven’t heard anything about above ground. As for the tables, those may be found on commuter rail but I’m unaware of light rail or subways that have them. Those require trains with a ton of room. The online graphic looks at average median household incomes near each Metro Rail station based on 2009-14 numbers. The Metro annual customer survey includes system-wide data for this ($14,876 for bus riders, $19,374 for rail riders); I like the idea of seeing it broken by geographic area. It will also be interesting to see if the median incomes shown in the LAT graphic in South Park in DTLA rise — I was walking down there after the Kings game last night and there are still quite a few residential buildings under construction, not to mention all the ones that have opened. Really interesting op-ed from my former colleague Robin Rauzi who has a novel take on Metro’s ridership dip: none of the other theories henceforth given for the dip hold water. Her hypothesis: A) there are an increasing number of ways to get around besides just driving your car or taking the bus/train (i.e. ride hailing, biking, walking, etc. ), and; B) it’s increasingly easier to not go anywhere because of technology that allows you to shop online, telecommute, Netflix, etc. ICYMI: Really cool video of the tunnel boring machine being lowered into the future Expo/Crenshaw underground station for the Crenshaw/LAX Line.